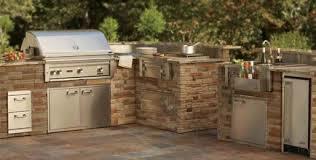 Built in barbecue grills are inset into an outdoor counter top or island. If you have an outdoor kitchen, a built in grill will probably become your favorite appliance because it allows you to cook a wide variety of food with minimal mess. Best of all, inset barbecue grills are available in many sizes allowing you to choose one that suits the size of your family or your desire to entertain guests. Built in barbecue grills can often be customized to complement your barbecue usage. For example, drawers, burners and other accessories can accent your barbecue to make using it more convenient. 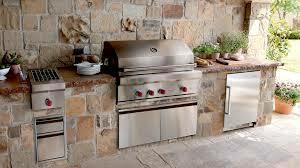 Additionally, a built in grill is often part of an outdoor kitchen or has work space around it, so it is not necessary to prepare food indoors or make frequent trips to an indoor kitchen when barbecuing. In contrast, cooking on a traditional grill may require you to go inside for utensils and food. Therefore, the convenience of a built in grill is likely to encourage you to barbecue more than ever. 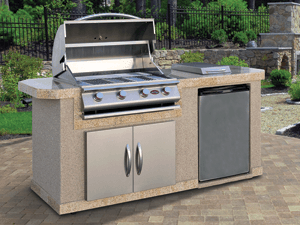 Although many traditional grills are sturdy, the unique configuration of a built in grill is less likely to become damaged from storms, high winds or other dangerous weather conditions because it is inset into counter tops, stone, brick or another material. The appearance of an installed barbecue is streamlined, sturdy and inviting. If you are purchasing a built in grill, the size of your space, the frequency you entertain outdoors and your price range will help you choose the best grill for your needs. Additionally, you will need to decide which features are important to you. Storage cabinets, drawers, cook tops, Barbecue Grill Grates and rotisseries are some of the many extras that can make a built in BBQ appealing. Before purchasing a built in barbecue grills, ask about the warranty. Barbecues with longer warranties indicate that the company is satisfied that it has produced a durable product. Built in barbecue grills are available in almost any style, and the grill you choose will influence how the food tastes. Choose from immovable grills fueled by electric, charcoal or gas. Before you make your purchase, consider trying food prepared from different grills so that you select one that gives you the flavor, convenience and cooking experience you will enjoy. Your outdoor kitchen gets complete with a built-in barbecue grill. An outdoor built-in barbecue grill on your backyard or patio is the best option for those who would like to enjoy weekend parties with family and friends. The pleasure of barbecuing during the summer and enjoying the weather is in itself a wonderful experience. These grills are designed is such a way that it requires little preparation and cleaning. There are various types of built-in grills available on the market offering numerous features. You can also select a grill from various options like propane, natural gas, electric, charcoal and/or infrared grills. Selecting a built-in grill might be a bit tricky as you can build a grill that will be a part of your outdoor with cabinets attached to it or you can choose a simple grill that can be set into place. Outdoor grill with cabinets is the best option for those having a big backyard where there is enough space to conduct a barbecuing get-together. If you have limited space but still would like to have an outdoor grill than a simple fixed built-in grill is the best option. One important point you must always remember is to take special of your built in grill by covering it properly and protecting it from the elements. BBQ islands can house portable grills or can permanently contain the outdoor grilling surface. Most BBQ islands have built in grills. The islands not only give the backyard grill a professional appearance but they add value to the home and are great for organizing. The best part is that these islands can be customized to fit the homeowner’s needs. Pre-made bbq islands save the homeowner the work of having to build one. They are designed to provide plenty of prep space in addition to cupboards and other storage. Some islands even have refrigerators and dishwashers built in. Most bbq islands will need plumbing and electrical lines ran to them. This means that a professional installation is probably best. They do add considerable value to the home but keep in mind some of the best islands can run upwards of $10,000 dollars. Pit barbecuing is a method of slow cooking meats in an airless hole or pit, thus smoking the meat while it still retains its delectable moisture. Bbq pits can be made from brick, steel, or even can be simply a hole dug in the ground. The meat cooks slowly for several hours- usually fifteen to sixteen hours. It may be difficult to decide which of the three types of bbq pits to put in the backyard. Brick pits means the homeowner will have to be familiar with masonry so that the pit withstands weather and heat; also it’s important there are no holes for the smoke to escape. Ground pits mean the homeowner will be digging a fairly large hole at least three feet deep and three feet wide. Steel pits are probably the easiest of the bbq pits to obtain. Traditionally these steel pits were made from old fifty-five gallon steel drums cut lengthwise. Today pits with a similar design can be bought online and have many features that can enhance the experience. Whichever kind of pit is chosen, it’s sure to turn out the most delicious meat the family has ever eaten. Having an island for the bbq adds a touch of class to the backyard. The islands not only provide an attractive place to keep the grill but also provide storage for accessories and back up fuel sources. Homeowners can easily build their own islands with bbq island frames. Bbq island frames provide the beginning structure for the islands. The homeowner can then complete the island with materials that match their home. Building a bbq island instead of purchasing one can save a lot of money. Bbq island frames should be made from steel or iron for durability and heat resistance. The islands are often completed with tile, stucco, or even brick.